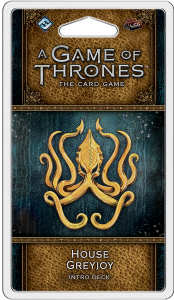 Join the battle for the Iron Throne with the House Greyjoy Intro Deck for A Game of Thrones: The Card Game! This pre-constructed deck introduces you to the mechanisms and key characters of House Greyjoy to provide a stable foundation and highlight the faction's unique features. By utilizing stealth attacks and pillaging your enemy’s strongholds, you will show your enemy why you do not sow.